Burt and Barbara's Gifts of the Heart, while especially crucial during the holiday season, is a year-round program to ensure that every adult in our care who lives by themselves, has no involved family, or runs the risk of being alone on birthdays or special occasions will not be forgotten. Recipients of these gifts include adults with behavioral health issues, HIV, intellectual disabilities, veterans, and the elderly. Visit our Amazon Wishlist where you're just a few clicks away from getting our older adults exactly what they need. You can also donate here and your contribution will help to ensure that we are able to bring a smile to everyone in our care on special days throughout the year. Learn More: Contact azibell@voa-gny.org to find out more about how you can help. "The Burt & Barbara’s Gifts of the Heart program is very important to us and our clients every year...Many of our clients are older and don’t have much family involvement, the program helps us make their holiday’s special." Burt and Barbara were residents of Willowbrook State School, an institution that until the 1980s housed more than 5,000 residents. A 1972 exposé by Geraldo Rivera revealed the inhumane conditions at the school, including physical and sexual abuse, and showed residents left unfed, unwashed and unattended for days on end. Barbara and Burt spent nearly half their lives at Willowbrook State School on Staten Island where the institution’s neglect and maltreatment of its 6,000 residents made it a national icon of shame. 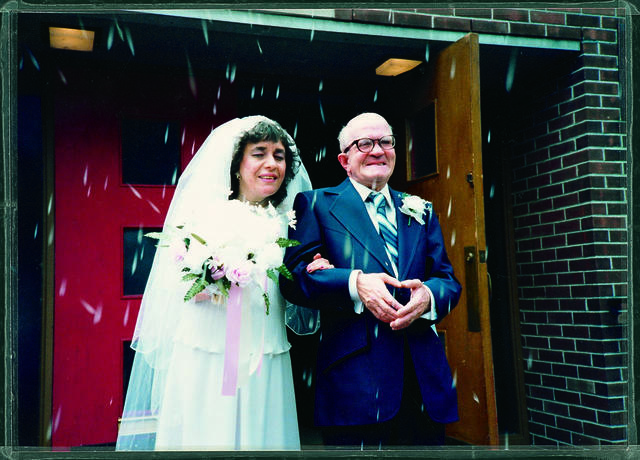 The couple met in 1978 — the year Willowbrook closed permanently — when both moved to Volunteers of America’s community-based homes for adults with developmental disabilities. They met on the bus that took them to their respective jobs at a sheltered workshop, and they fell in love. It took seven years, with Volunteers of America advocating on their behalf, for the state to grant them permission to wed, and on June 8, 1985, they did just that. The groom was 59 and the bride 42. Burt and Barbara celebrated their 32nd wedding anniversary this past June 2017. A few years ago, Burt found himself in the hospital on Valentine’s Day and his only worry was that he did not have a present for Barbara. He gave a nurse $5.00, all the money he had, to buy something at the hospital gift store. When he presented the gift and the card to Barbara, she was thrilled. Burt and Barbara were blessed to find each other, but there are many others in our community who do not have family or the resources to make the holidays. Volunteers of America is a lifeline for thousands of people who might otherwise be alone in the world including older adults living alone and with limited means, adults with special needs including veterans with acquired brain injuries, and adults with developmental disabilities like Burt and Barbara. Volunteers of America’s Gifts of the Heart program will ensure that every older adult in our care who lives by themselves, has no involved family, and runs the risk of being alone during the holidays, will not be forgotten. Watch Burt & Barbara celebrate their anniversary and learn more about their love story.